Morecambe Lifeboat crew members James Donnell and Steve Wilson with Matthew Black and Brett Coulton. 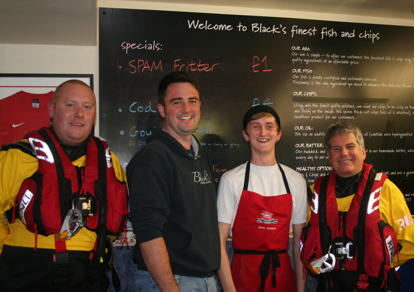 Blacks’ Fish and Chip shop in Halton is supporting the RNLI’s Fish Supper campaign which encourages people across the UK and Ireland to host a fish-themed meal for friends and family during the weekend of 13–15 October 2017. The Mayor of Lancaster, Councillor Roger Mace, is also holding a ‘Fish and Chip Supper’ on Thursday 12th October at the Alhambra in Morecambe doors open at 7.00pm. Tickets are on sale now, priced £10, from the Mayor’s Office with a choice of fish chips & mushy peas, sausage, chips & peas or cheese & onion pies & peas plus a drink. In 2016, National Fish and Chip Day was one of the biggest awareness days of the year in the UK and fish and chip lovers in Lancaster & Morecambe will be joining the rest of the UK to celebrate again on Friday, June 2nd. Like thousands of other chip shop owners, Matthew Black of Black’s chippy on High Road in Halton, will be marking the occasion with a money off promotion. Black's Chippy will be offering portions of traditional crispy battered Fish and hot fresh chips for a discounted price of only £5 on the day. Black’s has been serving fresh fish and chips to the local community and visitors to Halton since 2013 and they’re asking customers to come together to celebrate Britain’s best-loved fast food by tucking in to a portion of sizzling fish and chips. 'National Fish and Chip Day is an excellent way to show support not only for such a classic British dish, but also to each individual small business owner. I would encourage everyone, everywhere, to go down to their local chippy on Friday 2nd of June and order themselves a traditional portion of Fish and Chips to show their support." deserves and helping to secure its position as the nation’s favourite dish. The event, which will take place on the first Friday in June every year, already has the backing of key players in the industry. Visit www.nationalfishandchipday.org.uk to find out more.